Information that you enter that does not change often is called static information. When you enter details for a supplier, that information is called a masterfile record. You are able to create categories for your supplier accounts in Accounting. You can use these categories to sort your suppliers. For example, you may want to sort your suppliers as local or national, or by product ranges. You do not have to use supplier categories, and you can start or stop using them at any time. However, you cannot delete a supplier category that has a supplier account linked to it. 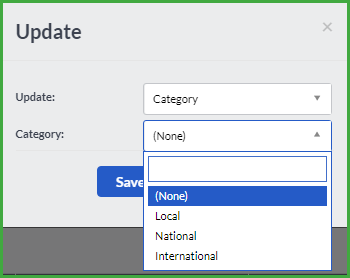 To add a new category, click on the Add Category button and then enter the name for the new category. You purchase the items that you resell or use in your products from your suppliers. To create or maintain your supplier accounts, click on Suppliers…Lists…List of Suppliers. The screen below will display. You can jump to supplier related processing screens by clicking on one of the links in the Quick Links section. In the Reports section, you can select a supplier related report to print. 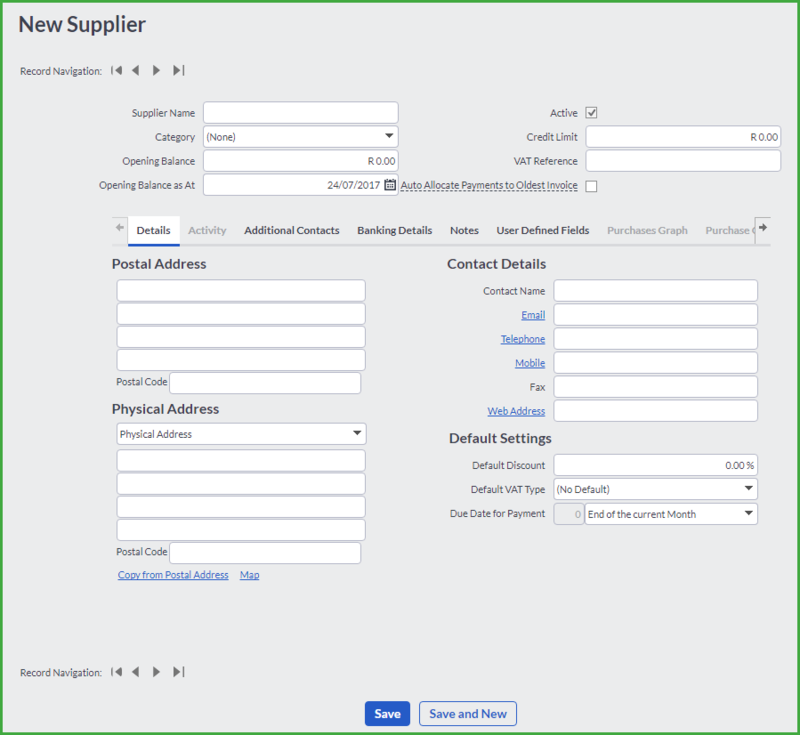 To create a new supplier account, click on the Add Supplier button and the screen below will display. This is where you will enter the masterfile information for your suppliers. 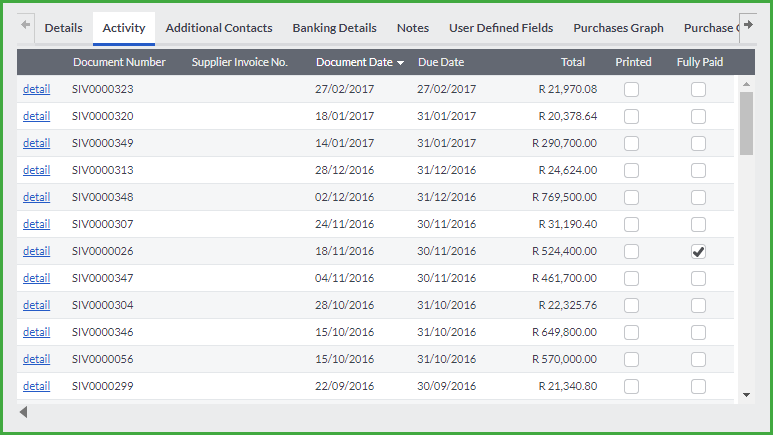 The Auto Allocate Payments to Oldest Invoice check box is automatically checked when creating a new supplier which notifies the system to automatically allocate the supplier’s payments to the oldest invoices. If you prefer to manually allocate payments to their corresponding invoices, uncheck the Auto Allocate Payments to Oldest Invoice check box. To skip between the masterfiles, click on the next or previous links. At the top of the screen, you will enter the supplier name, category, opening balance, credit limit and VAT reference. You are able to enter an outstanding balance for the account at a later stage by selecting the Adjust Suppliers Opening Balance option from the Suppliers menu. There are ten tabs on the screen, six of which you can edit and four of which Accounting will complete for you. You will enter your supplier’s postal, physical and website addresses, name, email, telephone, mobile and fax numbers on the Contact Details tab. This screen also contains some special features regarding the physical address, email, telephone, mobile number and web address. As you can see, these options are displayed in blue underlined text , which makes them active links. The Map button on the Physical Address will direct you to Google™ Maps which will pinpoint the supplier’s location. Addresses entered should be in a uniquely identifiable format, containing as much information as possible in order to find the locations and co-ordinates. The Copy from Postal Address button will automatically copy the postal address into the delivery address box. You will use this option when the supplier’s postal address and delivery address is the same. The Email button will instantaneously create an email, using the email address entered in this field. If you use Skype and want to make a Skype call, click the Telephone or Mobile links on the Supplier edit screen, and a Skype call will be started. The Web Address button will direct you to the customer’s website, if applicable. Accounting allows you to allocate a default discount to the supplier masterfile. You can enter the discount percentage in the Default Discount field, and this will pull through to the processing documents. 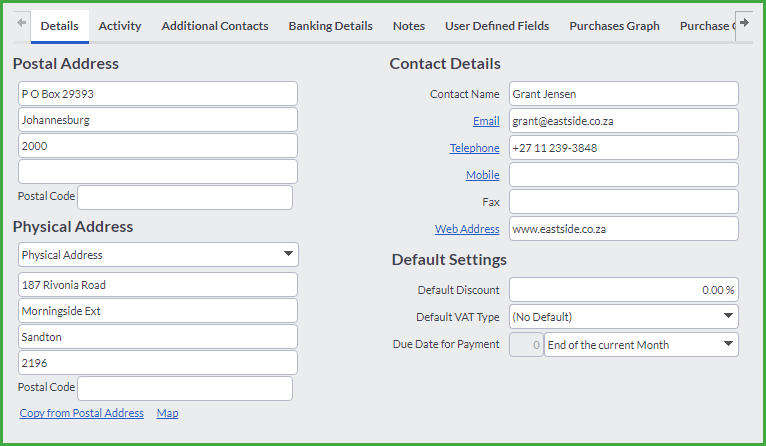 Users can also set a default VAT type which will apply when transacting (supplier defaults will override Item and Account defaults). 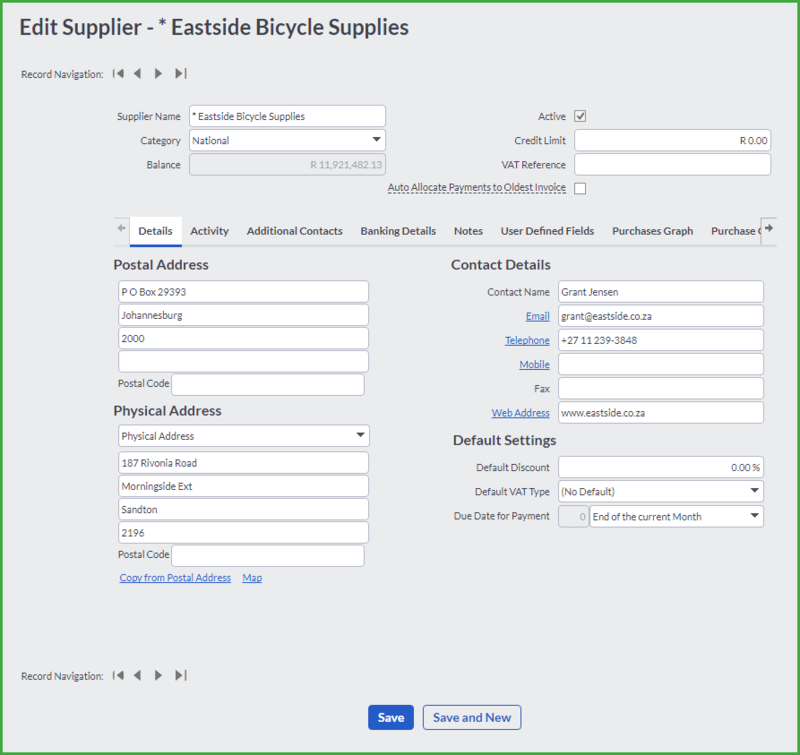 You can also set a default due date for your supplier documents. For example you must pay your supplier 30 days from the date of invoice. In the Activity tab, Accounting will display the opening balance, and the value of all invoices, returns and payments as well as the balance of the account. You can drill down to the documents making up the balance by clicking on the detail link. To record details for any other contacts that you may have at your supplier, you will use the Additional Contacts tab. You would use this tab if you have more than one contact at your supplier; for example, you may use the Address and Contact Details tab for the managing director of the company, and then record details of the sales rep and accounts clerk in the Additional Contacts tab. 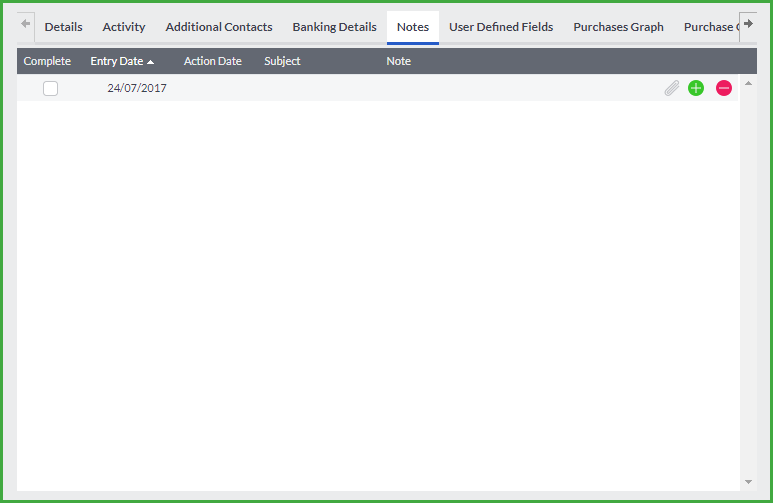 In the Banking Details tab, you are allowed to enter the banking details of the Supplier if you need to pay your supplier. 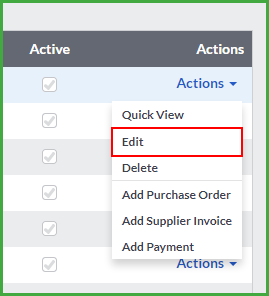 Tick the Allow Supplier Batch Payments tick box to allow the system to add the supplier on the Supplier Batch Payment feature when processing payments. To validate if the banking details are correct, enter the supplier banking details and click on the Validate button. 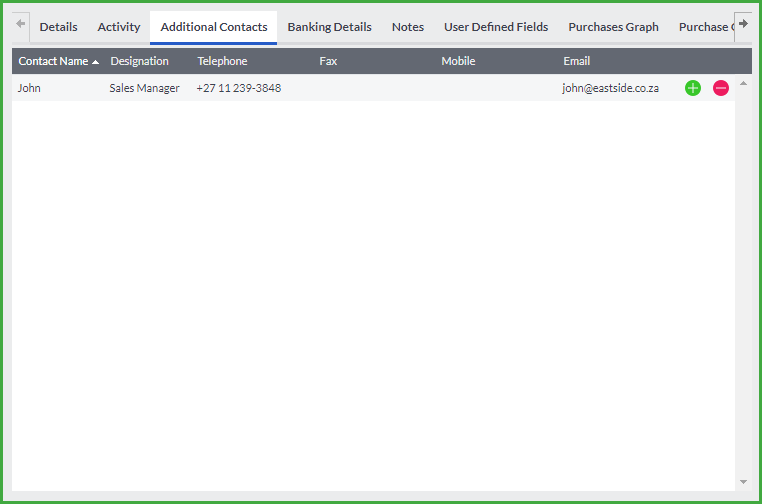 You will notice a green icon will display on the right hand side if the banking details are validated successfully. The main user will have to give the other users access to view or edit this feature. In the Notes tab, you will create and store any notes regarding the supplier. For example, if the supplier has a special running for a particular period of time, or if you must collect stock on a specific date, you would create a note with the details. If you create a note without entering an action date, the system date, or entry date, will be used as the Action Date. Notes appear in the Company Dashboard until they have been marked as complete. If you have set up User Defined fields in the Company Settings, you will enter the relevant information in this tab. 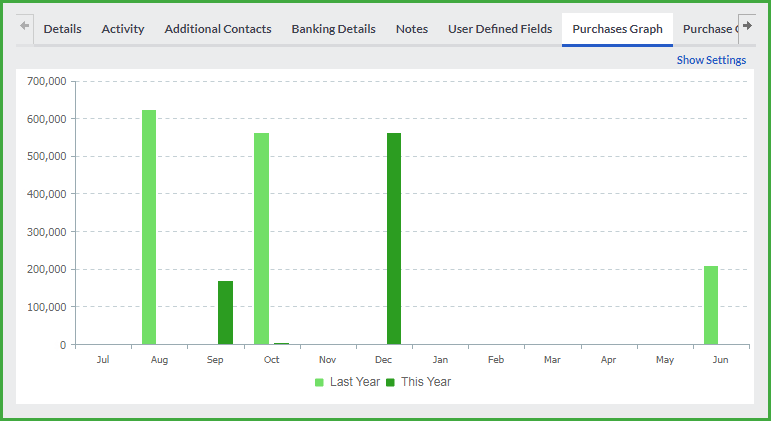 Once you have processed purchases from your supplier, Accounting will display a graph of the annual values, per month, in the Purchases Graph tab. If you would like to see more detail, you can click on one of the bars in the chart for a graph showing the daily purchases. You can then drill down to the transactions by clicking on one of the bars representing a day. Below is an example of a Purchases Graph for a supplier account that has transactions. 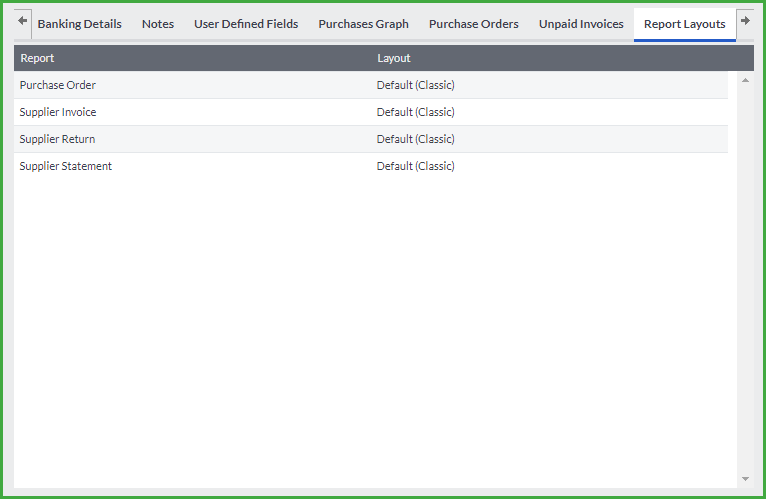 If you have processed any purchase orders, they will display in the Purchase Orders tab. You are able to open the purchase order from this tab by clicking on edit on each purchase order shown. Any unpaid supplier invoices are listed under the Unpaid Invoices tab. 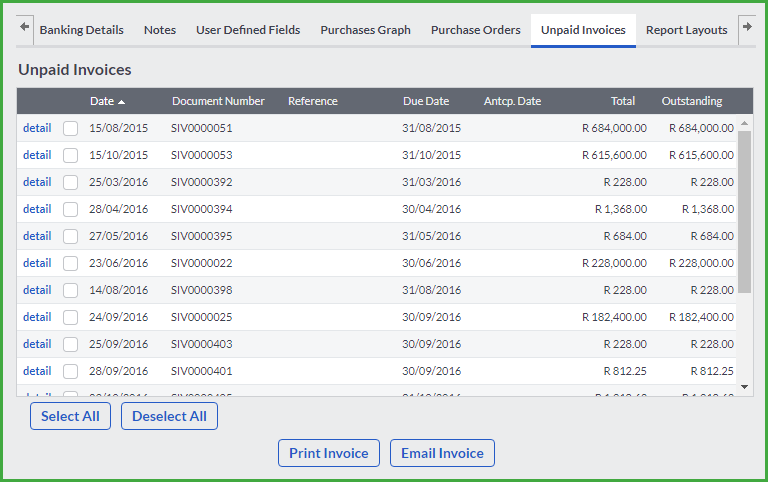 You have the option of selecting a range of invoices by checking the check boxes next to each invoice, and select to either reprint or email them by clicking on the Print Invoices or Email Invoices buttons. New management personnel that are appointed. New or added web addresses or email addresses. In order to keep your company records up to date, you will be required to update these changes to suppliers in your company database. To edit a supplier, click on the Actions option on the supplier line and select the Edit option or you can click on the green supplier name link. 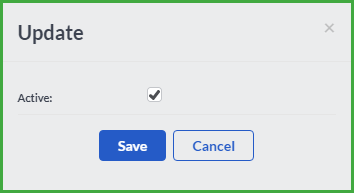 Once you made the change, click on the Save button. If you have captured the incorrect supplier information and want to delete the supplier account, you can do so in the List of Suppliers screen. 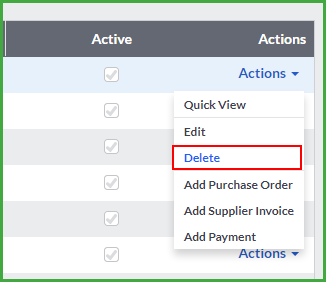 To delete a supplier, click on the Actions option on the supplier line and select the Delete option. You cannot delete a supplier account with transactions allocated to it.